Book in for some local toe-tapping entertainment with Redland City Bands’ drought relief concert at Redland Performing Arts Centre (RPAC) next Friday 19 October. Conductor Peter Francis with Mayor Karen Williams outside the Redland Performing Arts Centre. Redland City Mayor Karen Williams said Council was pleased to support the event, which would help raise funds and awareness for farmers suffering the devastating impacts of the prolonged drought. “With our rich agricultural heritage, many Redland Coasts locals – myself included – have an affinity with the farming community,” Cr Williams said. “This concert is a tangible way we can help, with all proceeds going to Drought Angels. 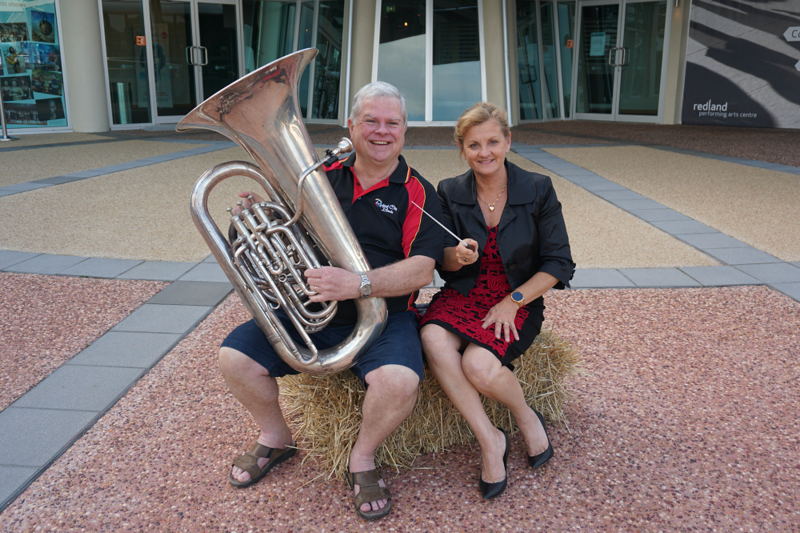 “Redlanders are known for their generosity and I thank Redland City Bands – and in particular conductor Peter Francis – for taking the initiative to put on such as event, which Redland City Council and RPAC are proud to support. Redland City Bands conductor Peter Francis said the concert would feature some great music in support of a great cause. “Every now and then a situation moves you… and this is one of those times,” Mr Francis said. “I found myself in a position of being able to help and surrounded by likeminded musicians willing to give freely of their time and talents. “Our big band and three concert bands will perform a variety of numbers, including the 1812 Overture, You’re the Voice, Carnival of Venice and selections from Mary Poppins and The Blues Brothers, to name a few. Tickets are just $15 for children and $25 for adults and can be booked online, or in person from the RPAC Box Office (2-16 Middle St, Cleveland).